In the world of computer gaming, bragging rights are accorded to those who can boast of blazing-fast graphics cards, the most powerful processors, the highest-resolution monitors, and the coolest decorative lighting. They are not bestowed upon those crowing about the energy efficiency of their system. If they were, gaming computers worldwide might well be consuming billions of dollars less in electricity use annually, with no loss in performance, according to new research from Lawrence Berkeley National Laboratory (Berkeley Lab). In the first study of its kind, Berkeley Lab researcher Evan Mills co-authored an investigation of the aggregate global energy use of personal computers designed for gaming—including taking direct measurements using industry benchmarking tools—and found that gamers can achieve energy savings of more than 75 percent by changing some settings and swapping out some components, while also improving reliability and performance. 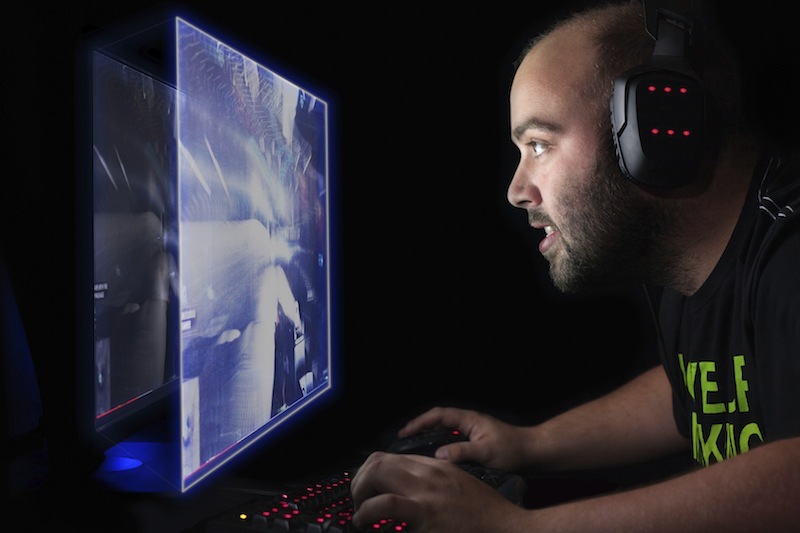 Gaming computers represent only 2.5 percent of the global installed personal computer (PC) base but account for 20 percent of the energy use. 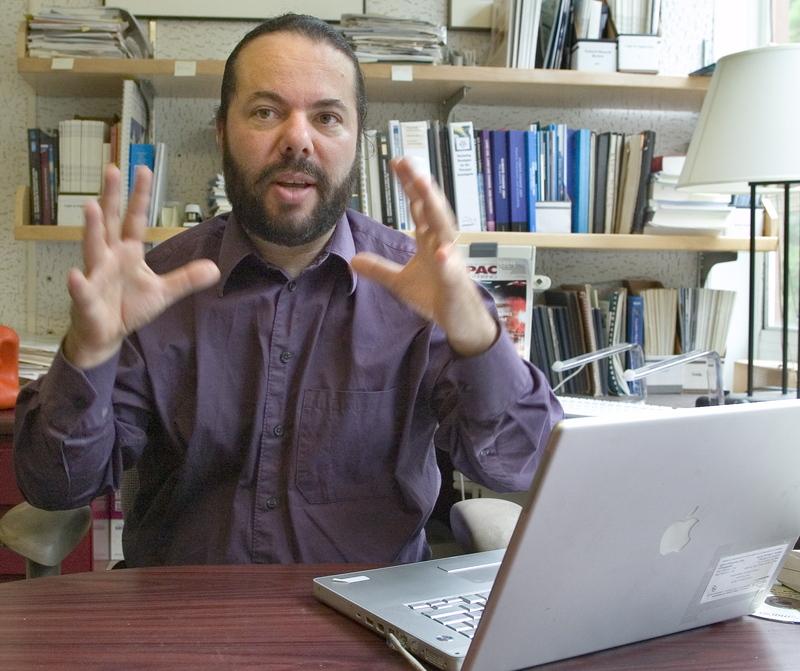 Mills calculated that a typical gaming computer uses 1,400 kilowatt-hours per year, or six times more energy than a typical PC and 10 times more than a gaming console. Berkeley Lab scientist Evan Mills found that gaming computers offer a potential estimated energy savings of $18 billion per year globally by 2020. The good news, he says, is that there is ample opportunity—for consumers, manufacturers, policymakers—to save energy. On the regulatory side, displays and power supplies are the only components that have energy ratings today, and those ratings are voluntary. Additional ratings for motherboards, hard drives, peripherals, and other parts are “an opportunity area,” Mills said. The gaming software itself can also be designed to use energy more efficiently. Consumers lack ready access to information that can help them to make efficient upgrades. The study measured and charted the performance versus nameplate (or rated) power consumption of many popular components. One problem the authors found was an immense variation in the nameplate power; for example, graphics processors ranged from 60 to 500 watts. Their computing performance varied considerably as well, by as much as five-fold. And there was little correlation between the two, meaning some units that were highest in performance had lower power consumption. The researchers also built five gaming computers with progressively more efficient component configurations, then followed industry protocols for benchmarking performance while measuring energy use. They were able to achieve a 50 percent reduction in energy use while performance remained essentially unchanged. Additional energy savings were achieved through operational settings to certain components, yielding total savings of more than 75 percent. The energy efficiency improvements for the bench tests on an actual gaming computer, from left to right, were progressively upgraded to a 92% efficient PSU (Corsair AX760), improved GPU (Zotac Geforce GTX 970 AMP! Omega edition), improved motherboard (ASUS Sabertooth Z97 Mark I) and CPU (Intel Pentium G3258), and improved display (ASUS VG248QE modified with NVIDIA G-sync). 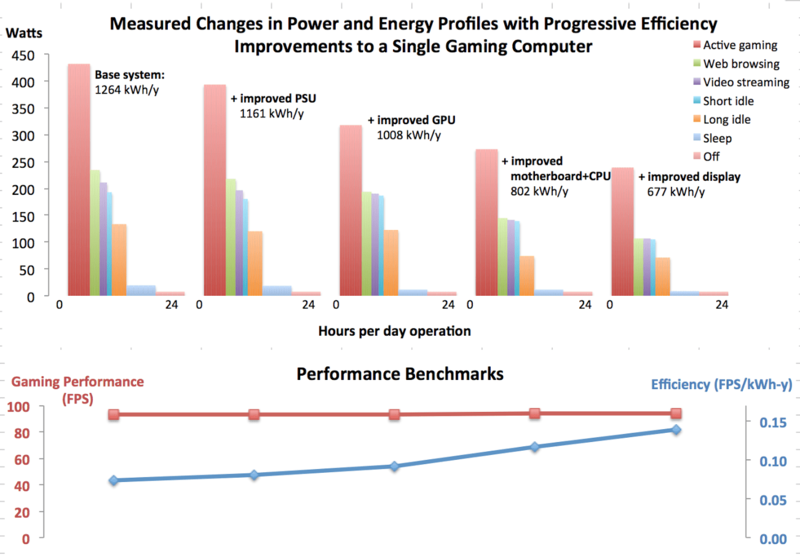 Gaming performance remained essentially unchanged, resulting in nearly a doubling of system energy efficiency. Average machine has 1.4 GPUs, and thus higher energy use. Mills has analyzed everything from the impact of climate change on the insurance industry to energy use in African villages, modern buildings, and data centers. This latest study was sparked when his son, Nathaniel Mills, started getting into computer gaming. Like one-third of all gamers, they decided to build a custom system, individually choosing the graphics card, motherboard, memory, hard drive, and other components to maximize gaming performance. The father-son team conducted the research and co-authored the article. Looking for power ratings before purchasing their parts, Mills quickly realized, “we’re building a power plant here!” Together they decided to measure and study the energy use. One indicator they looked at was their energy bill. Previously their monthly bill had gone down significantly after swapping in a large number of LED light bulbs. “Then the gaming started, and all those savings evaporated,” Mills said. Despite all the energy savings, Nathaniel Mills has decided to drop gaming and instead has helped his father develop and run a website, GreeningtheBeast.org, that they hope will start the conversation in the gaming community.